Gold rallied from the lowest price in more than four weeks on safe haven demand after the G7 nations threatened more sanctions against Russia after the annexation of Crimea. Meeting for the first time since last week’s annexation of Crimea by Russia, G7 leaders said they won’t attend a G8 meeting that had been set for Sochi, on Russia’s Black Sea coast, and will instead hold their own summit in June in Brussels. The G7 said in a statement that they remain ready to “intensify actions”, including coordinated sectoral sanctions. Trading volumes on the COMEX in New York today are 49% higher than the average for the past 100 days for this time of day, according to data compiled by Bloomberg. Palladium fell 1% to $786.20 an ounce. The precious metal rose above $800/oz yesterday, the highest since August 2011, on concern that supplies from top producer Russia will be disrupted. The Central Bank of Iraq said it bought 36 tons of gold this month to help stabilise the Iraqi dinar against foreign currencies, according to a statement from the bank that was emailed this morning. It is very large in tonnage terms and Iraq’s purchases this month alone surpasses the entire demand of many large industrial nations in all of 2013. It surpasses the entire demand of large countries such as France, Taiwan, South Korea, Malaysia, Singapore, Italy, Japan, the UK, Brazil and Mexico. 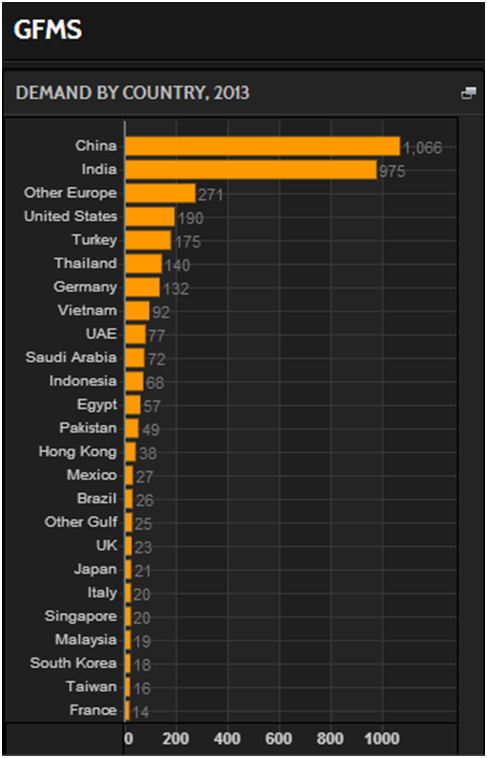 Indeed, it is just below the entire gold demand of voracious Hong Kong for all of 2013 according to GFMS data (see chart). Iraq had 27 tonnes of gold reserves at the end of 2013 according to the IMF data and thus Iraq has more than doubled their reserves with their allocations to gold this month. Gold remains less than 5% of their overall foreign exchange reserves showing that there is the possibility of further diversification into gold in the coming months. The governor of the Iraqi Central Bank, Abdel Basset Turki, told a news conference that, "the bank bought 36 tonnes of gold to boost reserves and this move is to strengthen the financial capacity of the country and increase the elements of security and insurance reserves of the Central Bank of Iraq." He said, “the purchase quantity comes with the aim of achieving the highest stages of the financial soundness for Iraq”. He pointed out that the measure comes within the purview of the central bank in the use of the fiscal policy tools of Iraq. "The Bank has purchased large quantities of gold bullion with a very high purity and in accordance with the approved international standards," according to the Iraqi central bank. Iraq quadrupled its gold holdings to 31.07 tonnes over the course of three months between August and October 2012, data from the International Monetary Fund shows. The IMF's monthly statistics report showed the country's holdings increased to some 23.9 tonnes in August 2012 to 29.7 tonnes. That was followed by a 2.3-tonne rise in September to 32.09 tonnes and then a cut of 1.02 tonnes in October 2012 to 31.07 tonnes. It is Iraq's first major move to bolster its gold reserves in months. The central bank of Iraq’s doubling of its gold reserves this month is important as there are many oil rich nations in the world with sizeable foreign exchange reserves, primarily in dollars, and only a small allocation to gold by these central banks alone could lead to higher gold prices. 36 tonnes is a lot of physical gold, however in terms of dollars it is worth just $1.522 billion which is a tiny fraction of the $80 billion of foreign exchange reserves that Iraq holds. Energy rich Russia alone has foreign exchange reserves of some $440 billion. Should they decide to allocate a sizeable portion of their reserves to gold, it would rapidly result in materially higher prices. Signs that the global economy is slowing down and the most serious confrontation between Moscow and the U.S. and its allies since the end of the Cold War is likely to lead to central banks continuing their foreign exchange diversification. Central banks and the smart money will continue to dollar cost average and accumulate bullion on dips.